First of all, who is Ben Franklin Craft Shop? Ben Franklin Crafts & Frameshop is a two-store retail operation located in Monroe and Bonney Lake, Washington. More than merely serving as a retail store, Ben Franklin Crafts & Frames has become a social and cultural centre for people in both store locations. Ben Franklin is now “the place to go” where home taught students can obtain new art education ideas, where families can have great positive fun doing art projects together, where people of all ages can fully explore their creative potentials in a friendly, supportive environment. What is special about the Christmas bowl? The Christmas bowl comes in a Christmas theme. It is coloured in mainly red and green which are Christmas colours. It also has a prominent Christmas design, such as a snowman or a Santa Claus, shaped on the exterior of the bowl. It may be used to store small items or it may be used for eating food or drinking soup. How does the Christmas bowl affect sales? The Christmas bowls can be branded with Ben Franklin Crafts Shop logo. This will increase brand awareness to attract potential customers to patronise Ben Franklin Crafts Shop. It will also boost brand recall for existing customers. This will encourage them to make repeat purchases and increase their customer base. It will also facilitate free advertising for Ben Franklin Crafts Shop. 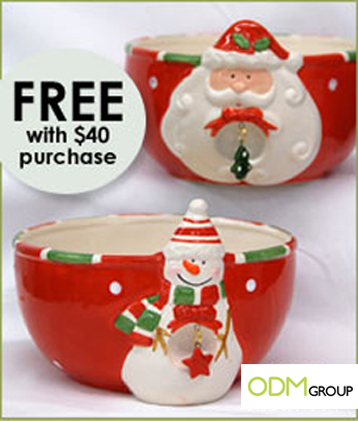 You may give out these Christmas bowls along side your promotional products this coming season. As it is a functional product, customers will still use the bowl throughout the year. What do you think?